Fear and anxiety problems are much more common in dogs than you might assume. It is easy to not realize this due to the fact that you seldom see many of these dogs in public due to their issues. On the other hand, you also may not realize that the dog pulling on the leash dragging their owner down the street, or barking and lunging at other dogs or strangers, or the dog relegated to the fenced yard running the fence and barking, is one of these dogs. You may have a dog that is what you may have identified long ago as "sensitive" or "over-reactive" to many new or novel experiences. Your friends or acquaintances may have told you to socialize him/her. And you may have done your best to expose your dog to people and situations without success, or even noticed the problem get worse. The well meaning people who suggest such a "simple" fix just do not appreciate your problem. Of course their suggestion may worked with their own dog, but it just isn't that easy with all dogs. Some dogs seem to barely need training. And some dogs adjust to new experiences easily with little effort. Not all dogs. Many variables can affect a dogs reactive tendancies. Breed, temperament, personality, experience, and more importantly lack-of experience, all affect behavioral responses to various stimulus. We also must be open to the fact that dogs, or people for that matter, don't all experience the same things the same way. Think of phobias for example. Some people have them, to various degrees, others do not. Socialization, is not necessarily as easy and obvious an experience to have, or provide, as it seems. People seem to think what it is to "socialize" is to just expose a puppy to as many experiences as possible. When in reality, it just isn't that simple. What is more important, is that you cause/help your puppy (or child) to experience new things, situations and people, the way you want him to. Help him behave in a calm, positive way. In this case, 'positive' means in a way that leaves the dogs less anxious. This is not an easy automatic thing and doesn't happen over night in one or two exposures. The way YOU can create the biggest changes in the shortest period of time is gaining the trust, and respect of your dog. Your leadership through these experiences is very important. You must have control of your dog. The ability to create calm behavior in the situation. Some people exclaim how much improvement they have seen in their "rescue" dog over years... I find this very unfortunate. Because with the right skills and understanding, SO MUCH MORE can be done to help a dog in such a short period of time. If you just knew how. Other people think that their dogs issues are "just how he is" or "how he has always been". That may be a true observation. But it isn't how it has to be. Even if you think you have "tried everything". Building confidence takes time, but can happen much more quickly than you think. Be open to learning more, improving your relationship, and changing your dogs experience of the world. So you can all be happier and have a better quality of life. Please call me to find out how I can help you. 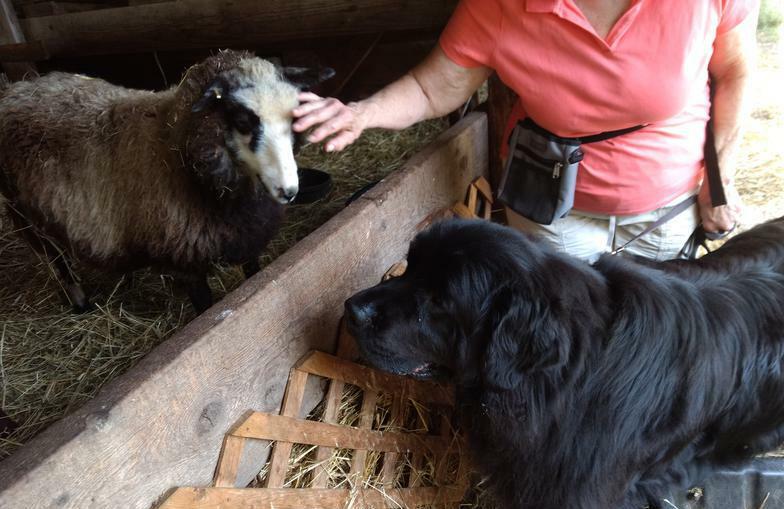 Sarah the Newfoundland, wasn't always the calm, unflappable picture of a Newf that many expect. Although still a sensitive girl, you would hardly know how fearful she used to be of people and other experiences. Now she is the picture of calm confidence... most of the time. She and her owner are much happier now and now working towards their goal of Canine Good Citizen and Therapy dog. Something that seemed like a challenging goal, not too long ago.